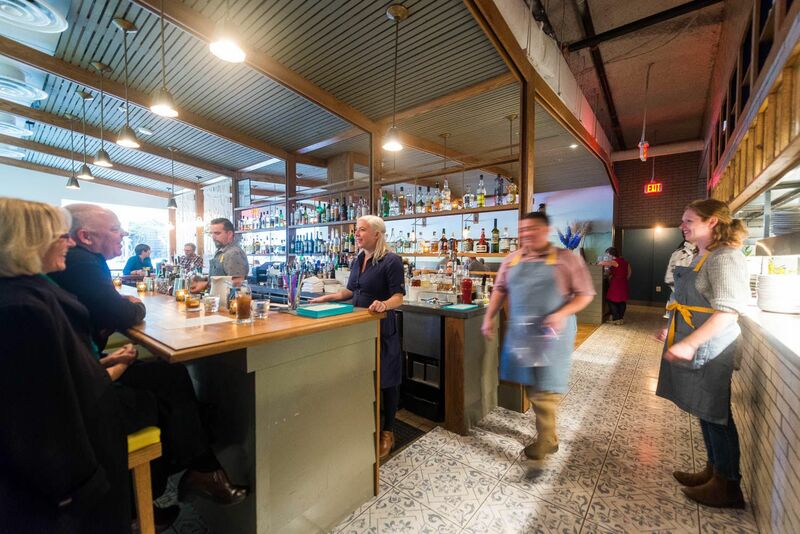 “When Tail Up Goat first opened, beverage director and co-owner Bill Jensen had a mantra. “I would adjust my tie in the mirror and say, ‘at some point this will all feel routine,’” he recalls. Nothing is routine at Tail Up Goat. But that’s what has helped it shine during its first year in business. Hospitality veterans Jensen, Jon Sybert (chef/co-owner) and Jill Tyler (co-owner/service director) came together to form the trifecta of hospitality: drinks, food, and service, respectively. They turned their debut restaurant into the kind of place they themselves would want to frequent, complete with avant-garde tipples, an eyebrow-raising moniker, and healthcare for the staff. The combination proved to be successful, earning Tail Up Goat local and national acclaim, as well as a Michelin star. The team sat down with Eater the afternoon following the first birthday bash to reminisce, give props, and look ahead. It seems like one of the first things people comment on is the quirky name and its backstory. When you were choosing the name, did you expect it to get so much attention? Jon Sybert: I don’t know that we thought that it would get much attention, but I think we knew we were attached to it right from the get-go. The name is from where Jill grew up in the Virgin Islands, and it was something that on a visit years and years ago … Jill and I looked at each other and were like, “that’s perfect.” Such a strange and irreverent saying. When we shared it with Bill a couple years later … he got so excited. It was one of the things that made us realize that the three of us would end up working together at some point. Jill Tyler: I don’t think we thought it would be like “Wait, what is this? What are you saying?” So it’s kind of been a fun story to get to tell. And it is personal and this nod to home where we always try to get away to. Bill Jensen: Never underestimate the power of a good non sequitur. 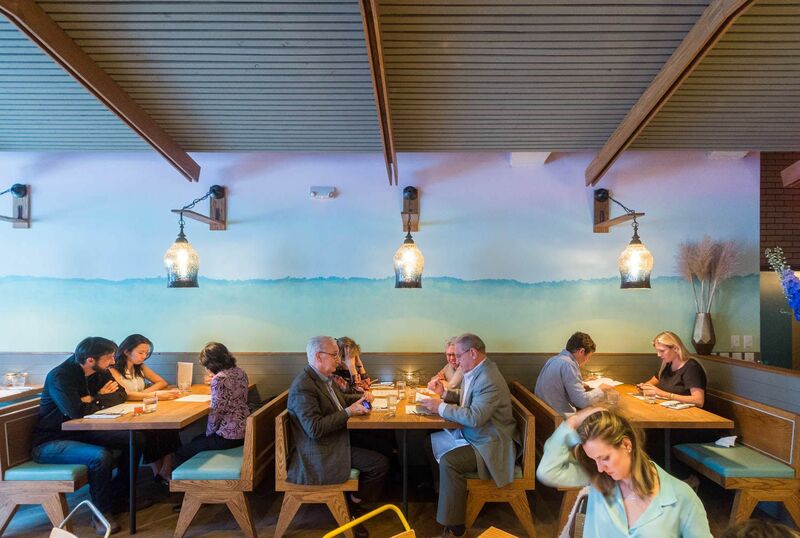 Did your time at Komi and Little Serow directly influence your vision for this restaurant? Or was it something that you had always been planning all along? JT: I think it’s always a hope and dream for so many people who work in this industry to be able to go out on your own and take lessons learned, but then really make your own mark. That’s at least how it’s felt for me in getting to open; it’s like building a place that’s so intensely us. What are the biggest challenges of running your own restaurant? JS: Staffing. We’re very lucky. I think we have great people. But that’s hard. JT: Paperwork. There’s paperwork upon paperwork upon paperwork … I didn’t know how many things I didn’t know until we did this. BJ: We all worked long hours when we were at former jobs and had a lot of responsibility, but I just think there’s mentally this shift when it is your baby. And it doesn’t matter where you are, whether you’re at the restaurant, whether you’re not at the restaurant, there’s always this piece of you that is worried about the place. Patrons settling in for a meal at Tail Up Goat. Photo by Rey Lopez. JS: What I don’t think I really saw coming was how responsible I feel for all of the people here. We employ 50-some people and that’s a really awesome feeling. And thinking that we do a good job taking care of them and supporting those people … is a really cool thing that I personally have found extraordinarily rewarding. BJ: Watching people respond to the stuff that you dream up … and being able to play a meaningful part in people’s day-to-day life as a more casual restaurant has been awesome. We hosted a rehearsal dinner for a couple regulars a few months in. We’ve been able to host a charity dinner for Miriam’s Kitchen. We’ve been able to close the restaurant because one of our cooks got married. I think that’s always the kind of restaurant we wanted to be. Can you talk a bit about how each of your strengths and skill sets complement each other in this restaurant? JS: Well, Jill’s the glue. JS: We’re the romantics. And overly so at times. BJ: We’re very lucky. I think we both take for granted how much creative license that we are both able to take on and run with just because Jill is there to do everything else. I’ve never been in that position and that’s amazing. JT: There have absolutely been moments where we’re like “ugh.” When you’re working with someone that closely, it’s like a family. But I think at the end of the day the reason it’s worked is we have so much respect for each other and what each of us can bring to the table. I completely respect both of them in just such huge, awesome ways. Many of the items on your menu have reached cult-favorite status. People buzz about the lamb ribs, the idea of a welcome shrub, and the goat lasagna, which Bon Appetit says was the best pasta of 2016. Are these still as popular as they were originally? Did you expect them to be the stars of the menu? JS: Funny thing about the goat lasagna was — not at all popular when it went on the menu the first time. I think it’s definitely one of those things that is a little difficult to read. But I think when people gave it a shot, they got a lot more into it. BJ: We’ve been in the position of being lucky enough that people have responded to what we do. And I think to our credit we’ve maintained the strength of our own convictions about the food and drink we want to serve. The first shrub was a celery shrub that was insanely divisive. JS: Bill and I are both in love with celery in a weird way. BJ: My wife hated it. I liken it to a seminal ‘70s underground punk act that only a few people ever saw. But the few people that saw were really into it. BJ: That is another cool thing about owning the joint is that you can pursue those flights of fancy and I think it’s important to take those risks. The dedicated bread course also gets a lot of love. It’s not your average dinner rolls and baguettes. Why did you choose to focus on out-of-the-box bread? JS: I have a very close friend of mine named Jared [Dalby] who’s in the kitchen right now, and he’s the mastermind behind all of our breads. I’m a pretty good baker; he’s a phenomenal one. And I think that when this whole thing started, I definitely wanted bread to be a focus because it’s something I personally love and feel like is underrepresented in a lot of restaurants in D.C. And I think it just kind of happened pretty organically when we got together and started talking about the menu as a whole. Given that it was your goal to be a true a neighborhood restaurant, how do you feel you’ve settled into the community of Adams Morgan? BJ: It’s been great. And it’s even greater because the three of us live … within walking distance, and the neighbors are great. The other really gratifying thing is I wasn’t aware of how many people live in this area, too. So every night we’ll have regulars that we know. But every night we have new faces that only live a block away, and that’s awesome. The bar at Tail Up Goat. Photo by Rey Lopez. JT: We’ve been so, so lucky with all the neighborhood support and love. JS: Super supportive as a whole, not just of us. I’m always in awe of how supportive the industry is of each other. The restaurant received glowing praise from nearly everyone, including great local reviews, a Michelin star, and national recognition as a best new restaurant finalist for Bon Appetit. How did this affect the restaurant? BJ: It hasn’t hurt business, so that’s good. JT: Frank Ruta of Palena would always tell his staff after something good came out, “that’s great, but put your head down and get back to work or it doesn’t mean anything.” We don’t want to be here for a year. We want to be here for a really long time. And that’ll only happen if we keep working hard. Featured photo by Rey Lopez.